This edited article about the Bridge of Avignon originally appeared in Look and Learn issue number 948 published on 22 March 1980. If you want to go dancing on the Bridge of Avignon, you still can. It will cost you 50p and the price of a ticket to France’s former papal city in Provence. 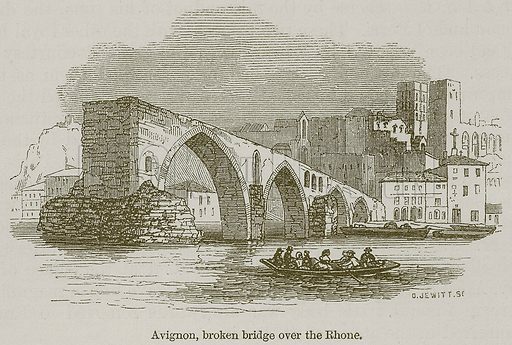 But the words of the old French song, about dancing sur le Pont d’Avignon (“on the Avignon Bridge”) should really be sous le pont; for people danced beneath it, not on top. The narrow bridge was built for pack-horses and donkeys and it simply wasn’t wide enough for merrymakers to join hands in circles for their traditional dance. Instead, they danced beneath the bridge on the Ile de la Barthelasse, a long, thin, reed-covered island that forces the Rhone into parallel channels beside the city walls. Four hundred years ago a pleasure garden was built here and the dancing was a feature of the summer gaiety. Today there is no sign of the pleasure gardens and the bridge that once spanned both channels of the fast-moving Rhone has lost 18 of its original 22 arches. Now it is just a pier, projecting from Avignon’s fortified walls and falling just short of the island. There is no sign of the arches that connected it to the far bank. The great river, that rises in Switzerland, passes through lake Geneva and flows wide and fast through central France to the marshy delta of the Camargue, has washed most of them away. In 1602 the first three arches of the bridge were brought down by the flooding river. The construction of the bridge is said to have been started by a peasant boy called Benezet, in 1177. It was the first stone bridge to be built across the Rhone between Lyons and the sea. Benezet was a local shepherd boy who, the legend says, was visited by Christ while he was watching over his flock. The Lord told him he must go to Avignon to build a bridge. The lad went to the city’s bishop and told him about the Lord’s plans. The boy’s story made the bishop so angry, that he threatened to cut off his hands and feet for telling such a blasphemous tale. First, however, he put the boy to the test, telling him that if he could lift a certain stone that three dozen strong men couldn’t shift, then he would believe his story. Benezet did it. The bishop was overcome and he offered him 300 pieces of silver to build the bridge. When the citizens heard the story, there was no shortage of volunteers to help span the river. Twelve years later the Avignon Bridge was complete. Sarah Josepha Hale’s poem “Mary Had A Little Lamb” was first published in her book of verse Poems For Our Children, published on 24 May 1828. To celebrate this anniversary here is the poem as illustrated by artist Clive Uptton. Follow this link to see more of Uptton’s wonderful artwork. 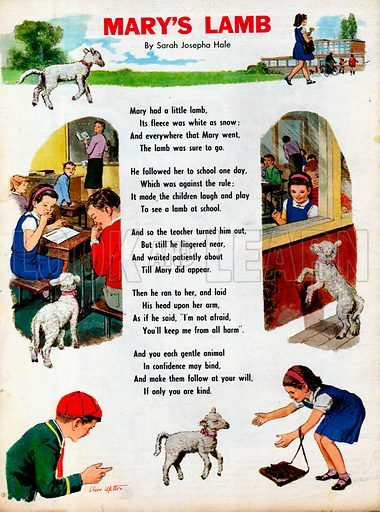 For more pictures of sheep and lambs, click here – or here for a large selection of children’s poems. 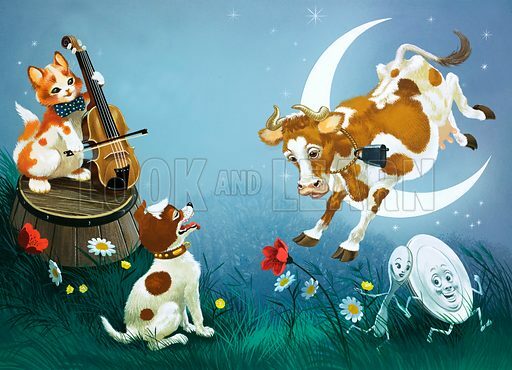 It is difficult to encapsulate an entire nursery rhyme in a single picture. This picture, by an unknown artist, achieves this objective effortlessly.